Semiconductor company Micron Technology (MU) reported positive top and bottom line results for the second quarter of 2018. Revenue climbed 58% year-over-year to $7.35 billion, driven by increased demand across the company’s products and end markets. GAAP net income more than tripled to $3.31 billion or $2.67 per diluted share. 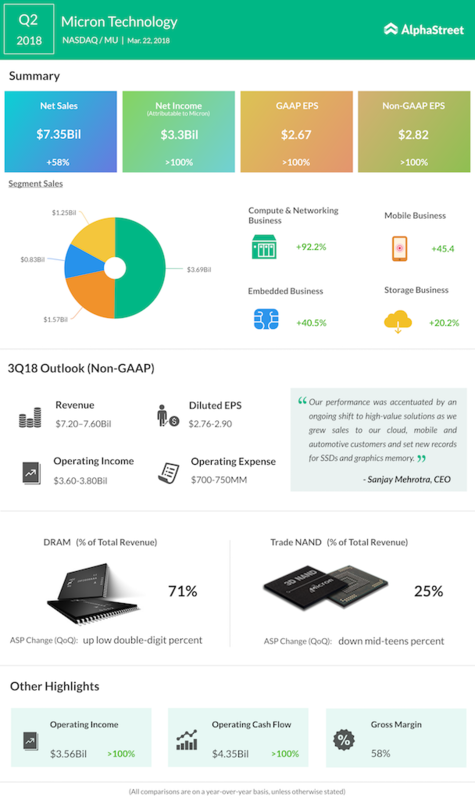 For third quarter of 2018, Micron estimates non-GAAP revenue to be in the range of $7.20-7.60 billion. On an adjusted basis, the company expects earnings to be in the range of $2.83 +/- $0.07 per share. DRAM revenue accounted for 71% Micron’s total revenue in the recently ended quarter. According to DRAMeXchange, global DRAM revenue grew 14.2% QoQ to $21.89 billion in 4Q17. DRAM revenue surged 76% year-over-year in 2017. Mobile DRAM revenue hit an all-time high of $8 billion during 4Q17 with Micron achieving QoQ sales growth of 58.8%. Global DRAM revenue is expected to reach $96 billion in 2018.